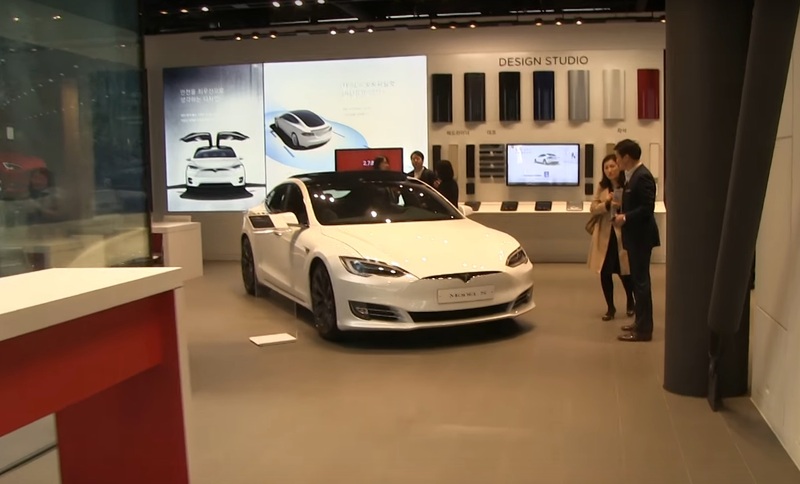 Starfield Hanam mall was brimming with enthusiasm last Wednesday when visitors flowed in and out to witness two Tesla Model S 90Ds parked on the second floor of the mall and inside Tesla’s long-awaited South Korean showroom. The launch of Tesla Korea was all that much more exciting because the original November opening date had to be postponed due to government approval and registration process delays. A second Tesla showroom and service center located in the high-end Cheongdam-dong, Gangnam District in southern Seoul, opened in quick succession on Friday. According to The Korea Times, Tesla Korea sent emails earlier in the week to customers who had preordered one of the company’s all-electric models to appraise them of the locations of the new showrooms and their store hours. The email included an invitation to test drive the Tesla S 90D, which is the only model that, at this point, has been approved by the South Korean government. We’ve provided a video from Norwegian Tesla owner and YouTube personality Bjørn Nyland who visited the multi-story Tesla store in the Gangnam District. The cost for a Tesla Model S 90D begins at 121 million won ($106,937) and fetches upwards of 161 million won ($144,442) with the selection of additional options. Tesla and the environment ministry confirmed that the 90D would not be eligible for government EV subsidies. Customers were invited to apply for the 20-30 minute test drive through an online reservation process. The response was so immediate that there is now a approximated six month wait to land a test drive of the Model S.
“I’ve been waiting [for Tesla’s arrival]…It comes down to two things: maintenance cost and the environment,” said Kim Jung-hoon via Forbes, who was browsing at the Tesla Seoul showroom. “The car’s performance and design are actually better than I expected.” With approximately ten test drives per day available at each showroom and heavy demand, interested buyers may need to wait around six months before they can get behind the wheel of the Model S 90D and take it for a test drive. This is longer than the three months it would take Tesla to manufacture then ship the vehicle from Palo Alto. Teslas ordered now in South Korea are expected to be delivered in June. Tesla acknowledges the importance of the extended global market in its overall business plans, with recent launches in New Zealand and the United Arab Emirates. Tesla first expanded into China and Japan in 2014. Other Asian Tesla markets currently include Hong Kong, Singapore, and Macau. Tesla Taiwan opened in 2016.